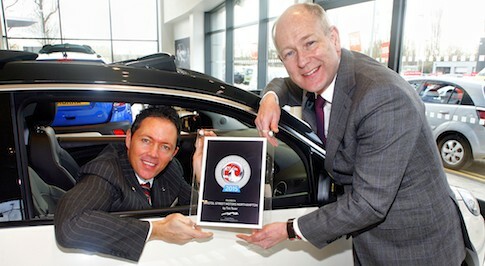 Bristol Street Motors Vauxhall in Northampton has been recognised with a national award for excellent customer service. The Carousel Way dealership team was presented with the Customer Excellence Award after being named as one of the top sites for customer satisfaction across the Vauxhall national network. British manufacturer Vauxhall rewarded top performing dealerships based on feedback from customer surveys about the quality of service they received for both sales and service. Tim Tozer, Chairman of Vauxhall Motors, presented Chris Megginson, General Manager at Bristol Street Motors Vauxhall Northampton with the award. Chris Megginson, said: "I'm very proud of my team here at Bristol Street Motors Vauxhall Northampton and it is fantastic to receive such a prestigious accolade. Receiving an award based entirely on customer satisfaction, from Tim Tozer at Vauxhall is an honour and we are always looking for new ways to improve our customer service which Bristol Street Motors prides itself on. Andrew Lyon, Regional Operations Manager at Vauxhall, said: "Each year, Vauxhall Motors recognises the Top 50 Retailers in Customer Excellence with this Award and it's great to see Bristol Street Motors Vauxhall Northampton being recognised as one of the Top 50. The Award is based on customer feedback on both sales and service, so to be in the Top 50, Bristol Street Motors Northampton has demonstrated that they can deliver customer satisfaction right across the business. Customers can be confident with Bristol Street Motors that they will receive great service!"